Columbia University, Visiting Research Professor, Heilbrunn Department of Population and Family Health, Mailman School of Public Health, 1/15-8/15 (sabbatical appt). Peter Lang Publishing, Series Editor for Social Sciences and Humanities, Black Studies and Critical Thinking Book Series, 2010-present. The Center for Genetics and Society (CGS), Fellow, 6/12-present. Adelphi University, Professor of History & Interdisciplinary Studies and Director, Center for African, Black & Caribbean Studies Programs, 6/03-present. New York University, Visiting Research Professor, History Department, 1/07-8/07 (sabbatical appt). The Institute for Biotechnology and the Human Future (IBHF), Fellow, 2/06-6/10. Adelphi University, Associate Professor of History and Interdisciplinary Studies & Director, African American & Ethnic Studies Program (tenure track), 1/00-5/03. Georgetown University, Assistant Professor (tenure track), Women's Studies Program and History Department, 8/96-12/99; Kennedy Institute of Ethics, Faculty Associate, 1998. Georgetown University, Visiting Associate Professor, Edmund A. Walsh School of Foreign Service, Women's Studies Program and History Department, 8/92-6/96. University of Maryland at College Park, Visiting Associate Professor, School of Social & Behavioral Sciences, Afro-American Studies Program, 2/93-5/98. Taught large (250 students) African American Culture and History survey courses. Hood College, Associate Professor (tenure track), Department of History, and Director, African American Studies Program, 9/91-6/92. University of Maryland at College Park, Faculty Research Associate/Programs Coordinator, School of Social and Behavioral Sciences, Afro-American Studies Program, 5/90-8/91. Georgetown University, Visiting Associate Professor, Women's Studies Program, 1/90-5/92. National Museum of American History, Smithsonian, Resident Faculty Fellow, 1989. Center for Women’s Policy Studies, Washington, DC, Research Associate, 1989. Bangalore University and American Studies Center at Hyderbad, India, Fulbright Professor, 1988. Appointment: Women in International Development. Hunter College, Visiting Assistant Professor, Women's Studies Program & Department of Black and Puerto Rican Studies, 1/87-6/87. Wellesley College, Assistant Professor (tenure track), Department of Black Studies, 9/82-6/88. Dana Hall School, Wellesley, MA, Faculty, Summer Institute of Women's Studies, 7/87. Harvard University, Associate, DuBois Institute for Afro-American Research, 1986-87. Simmons College, Boston MA, Lecturer, Afro-American Studies Program, 9/86-12/86. Harvard University, Associate, William E. B. DuBois Institute for Afro-American Research, 1982-83. Wellesley College, Lecturer, Department of Black Studies, 9/79-8/82. Solomon Fuller Mental Health Institute, Boston City Hospital, Lecturer, Family Studies and Community Health Program, 3/79-5/79. Blacksides Films, Researcher for Documentary, Boston, MA, 3/79-8/79. Harvard University, Teaching Fellow, History Department, 8/78-6/79; Graduate Research Fellow, William E. B. DuBois Institute for Afro-American Research, 8/78-6/79. Assisted with program implementation of an NEH funded humanities research center in its first year; coordinated visiting scholar's program, assisted in the planning for a national symposium, public relations, and community outreach. Duke University, Teaching Assistant, Department of History, 9/75-9/76. Duke University, Teaching Assistant, Oral History Program, Summer, 1974. My plans for the coming year are as follows: I plan to continue the tradition of excellence in instructional teaching that I have established over the course of the sixteen years that I have been on the faculty at Adelphi. Fine teaching, including using research findings to improve the pedagogical scope of my classroom instruction, has been and will continue to be the hallmark of my professional contribution to Adelphi. I have established an international reputation in an important scholarly/public policy areas of concern -- the rights of the child in transnational surrogacy agreements; my plans include continuing to pursue speaking engagements and to publish in this important area. I have become increasingly concerned about civil society responses to emerging biotechnologies, many of which are proliferating faster than our governance mechanisms can handle. As a trained historian I have used historical and contemporary sources, documents, narratives and social science analysis to broaden deepen and render more complex my analysis of contemporary and emerging public policy, social development issues, ethics, and governance challenges for public and civil society stakeholders in the 21st century. In this vein, earlier in this decade I accepted an invitation to volunteer to develop and chair a working Task Force on Gender, Eugenics and Biotechnology for a feminist human rights organization (The Committee on Women, Population and the Environment) known for disseminating cutting edge research. Since that time, with funding from the Heinrich Boell Foundation (Germany), the Center for Genetics and Society (US), the Committee on Women, Population and the Environment (US), and Adelphi University, in recent years I have been especially active on the international level making presentations at human rights, public health, public policy and bioethics conferences on the new human genetic and reproductive technologies. Building on the success of engaging concerned academics, scientists, lawyers and activists in many venues, I began collaborating with others concerned to promote the creation of responsible governance of the new reproductive and genetic bio- technologies. In this vein, I proposed and worked with others to organize an important and unprecedented conference to promote further dialogues and public discourses among differing civil society stakeholders regarding emerging reprogenetics. Gender and Justice in the Gene Age (GJGA) brought together engaged academics, progressive scientists, lawyers, public intellectuals and reproductive justice advocates, women’s health and women’s social rights advocates, racial justice advocates, and disability and queer rights activists in a series of dialogues intended to advance discourses about governance and the human genetic and reproductive technologies. GJGA was held at the Ford Foundation in the spring 2004. The small planning committee composed of engaged academics, advocates and activists, set as our the task convening an international conference that brought together participants who almost never sit down and talk together in the same room. Much of my research, scholarship and teaching over the past several years have focused extensively on the ideologies and protocols that drive the uses of many of the genetic technologies that impact women’s bodies, indigenous peoples, people of color, agriculture and medicine. I have also looked very closely at the role of technology in emerging efforts to enclose the knowledge commons (the human genome), and some of my papers and presentations have focused on the bio-politics of TRIPS (trade related intellectual property) and indigenous peoples DNA, their plants and medicines. Much of my work has also specifically linked the development of social and public policies with the misuse and/or abuse of medical science or scientific research, either by the state or increasingly through consumer choice paradigms that often exacerbate existing marginalization and discriminations. Hence, in assessing a legacy of gender, racial and class marginalization, I examine the implications of socially constructed theories of biological determinism for the exercise of human rights and access to social justice for women, the poor and people of color. Known in the past as state sponsored Eugenics, my research considers the implications of the new face of Eugenics, namely, consumer drive Eugenics. I am working on an edited volume, Gender, Race, Health and Justice in the Gene Age, which is consists of twelve original essays. The purpose of the book is to examine the profound ethical, political and social implications posed by the rapid emergence and proliferation of reproductive and genetic technologies. The volume is directed at civil society constituency stakeholders including scholars and teachers, students, journalists, social justice advocates and community engagement activists, program officers whose funding decisions impact transnational civil society, elected officials who oversee the creation of governance, and interested laypersons. My research interests in recent years have focused on the importance of deconstructing science and the ideological which technology serves. Specifically, I am interested to explore the social construction of knowledge and the impact of socially constructed beliefs (many of which held science captive) on the formation of the “sciences” in the mid to late 19th century. The goal is expose the creation and impact of the pseudo-sciences (craniometry, etc. ), scientific racism, gendered science, and Eugenics. I am interested to demonstrate that well intentioned, well educated health professionals, including the doctors in charge of developing the US Public Health Service were captivated and convinced that Eugenics constituted good scientific thinking (to the point of conducting what is still regarded as the longest experimental research study on a human population – the infamous Tuskegee Experiment). Some of my work explores the development of genetic based reproductive technologies and poses questions about whether Eugenics remains embedded in attempts to enclose and market consumer driven designer genetics? Further, this essay explores the consequences of consumer Eugenics for historically marginalized groups. I have also looked to understand how Eugenics advocates targeted racial, ethnic, religious minorities, the disabled, the “dark, swarthy hoards.” Eugenics targeted people of color in the global South as well as in the United States for the population planning programs, put and held in place well after the excesses of state sponsored Eugenics was exposed and condemned in Nuremburg. In “Eugenics Unbound,” I examined the connection between Eugenics thinking and the attack on poor women in the global South as engaging in and promoting “excessive fertility.” Aside from presenting a troubling legacy that has worked its way into development policy, planning, and implementation, this chapter questions whether social policies are being put into place following three decades of human rights initiatives on behalf of raising the status of the world’s women, to protect women’s human rights protections as pharmaceutical controlled genetics based clinical trials in the global South are already underway. I pose the question of whether the pharmaceutical industry should have oversight responsibility for insuring human rights protections for clinical trial participants who are poor and colored? Recently, in “Gender and Biopolitics” I have explored the development of the bio-politics that connect red, green, white biotechnologies and nanotechnologies. Intellectual property rights stand at the center of issues concerning who patents and profits from plant, animal and human DNA. My work argues that TRIPS (Trade Related Intellectual Property) presents us with troublesome and disquieting ownership issues that have arisen regarding the relationship between drug companies and the indigenous people on whose land most of the germplasm of interest to pharmaceutical companies is located. In January, 2007 I prepared a plenary presentation for a National Bioethics Conference at Nehru University. In that paper I examined the development of genetic interventions into In-Vitro Fertilization (IVF), especially the issues that IVF has been unregulated in the United States. I focused on raising questions about the decline of the “precautionary principle” in some medical and scientific procedures and protocols. All in all, I am working to expose and explore the New Face of Eugenics, and examine the social justice implications of emerging biomedical and inheritable genetic technologies in the United States. There is significant evidence that there are compelling reasons to be concerned about social justice and human rights in the gene age. I argue that the creation of enforceable governance is necessary to protect women’s reproductive health and rights and human rights, indigenous and poor peoples rights, and plant, human and animal DNA biodiversity from the ways in which a second enclosure movement would collapse human, agricultural and medical security for millions. Marsha J. Tyson Darling, ed., (2001). Race, Voting, Redistricting and the Constitution: Sources and Explorations on the Fifteenth Amendment, Volume 1: The 14th and 15th Amendments and the Voting Rights Acts of 1965,. New York, NY: Routledge Press. 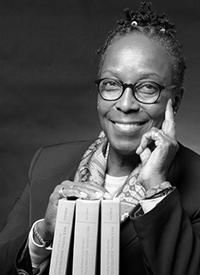 Marsha J. Tyson Darling, ed., (2001). Race, Voting, Redistricting and the Constitution: Sources and Explorations on the Fifteenth Amendment, Volume 2: Enforcing and Challenging the Voting Rights Acts of 1965,. New York, NY: Routledge Press. Marsha J. Tyson Darling, ed., (2001). Race, Voting, Redistricting and the Constitution: Sources and Explorations on the Fifteenth Amendment, Volume 3: Alternate Redistricting, Registering and Voting Systems,. New York, NY: Routledge Press. “Not Without Struggle I Rise: Creating a Habitable Space in Predominantly White Institutions,” in Dolapo Adeniji-Neill and Anne Mungai, eds. Written in Her Own Voice: Auto-ethno-edu Biographies of Women in Higher Education, Volume I,” New York: Peter Lang Academic Press, 2016. “The Welfare Principle in Children of Surrogacy,” in Shamita Das DasGupta and Sayantani DasGupta, eds., Outsourcing Life: Globalization and Transnational Surrogacy in India, Boston: Lexington Press, div. of Rowman & Littlefield Publishers, 2014. “From Chattel to First Lady: Black Women Moving from the Margins,” in G. Reginald Daniel and Hettie William, eds., The Myth of a Post-Racial America in the Obama Era, Jackson, MS: University of Mississippi Press, 2014. "The Quest for Equality: From Reconstruction to Obama," in Mario J. Azevedo, ed., Africana Studies: A Survey of Africa and the African Diaspora, 4th Edition, Durham, NC: Carolina Academic Press, 2013. "Lifting As We Rise: Black Women in America," in Mario J. Azevedo ed., Introduction to Africana Studies, 4th Edition, Durham, NC: Carolina Academic Press, 2013. “The Personal is Always Political: Reflections on Creating Habitable Space in Academia,” in Sandra Jackson and Richard Greggory Johnson III, eds., The Black Professoriat : Negotiating a Habitable Space in the Academy, New York: Peter Lang Publishing, 2011. “Burdened Intersections: Black Women and Race, Gender and Class,” in Julius O. Adekunle and Hettie V. William, eds., Colorstruck: Essays on Race and Ethnicity in Global Perspective, University Press of America Inc., 2010. “Gender Intersectionality: The Unfinished Business of Justice Advocacy,” in Richard Greggory Johnson III, ed., A 21st Century Approach to Teaching for Social Justice: Educating for Both Advocacy and Action, Birkdale Publishers, 2010. Marsha J. Tyson Darling (2009). Early Pioneers. In Michael Ezra, ed., (Eds.). The Civil Rights Movement, Perspectives on American Social History Series. ABC-CLIO Press. Marsha J. Tyson Darling (2009). Teaching Gender Intersectionality for Social Justice Advocacy and Action. In Richard Greggory Johnson III, ed. (Eds.). A 21st Century Approach to Teaching for Social Justice: Educating for Both Advocacy and Action. Lang Publishers. Marsha J. Tyson Darling (2008). The Creation of a ‘Shadow Economy’: The Feminization of Wage Labor and Micro Enterprise in the United States. In Ho Hon Leung, Raymond Lau, Sharon Shaw-McEwen, eds., (Eds.). Investigating Diversity: Race, Ethnicity, and Beyond. United Kingdom: Oxford, U.K.: Forum on Public Policy and the Oxford Round Table at the University of Oxford. Marsha J. Tyson Darling (2008). Gender and Justice in the Gene Age: The Challenges Presented by Reproductive and Genetic Biotechnologies. In Francesca Molfino and Flavia Zucco, eds., (Eds.). Women on Biotechnology, Scientific and Feminist Approaches. European Commission and Springer Press. “Gender and Biopolitics,” in Ana Agostino & Glenn Ashton, eds., A Patented World? : Privatization of Life and Knowledge, Johannesburg: Heinrich Boell Foundation, 2006. “Who Really Rules the World,” in Srilatha Batliwala & David Brown, eds., Claiming Global Power: Transnational Civil Society and Global Governance, Boulder, CO: Kumarian Press, 2006. “2000 Presidential Election in Florida,” in Charles D. Lowery & John F. Marszalek, eds., Encyclopedia of African American Civil Rights: From Emancipation to the Present, 2nd edition, Westport, CT: Greenwood Press, 2003. “Eugenics Unbound: Race, Gender and Genetics,” Women’s Health, Women’s Rights: Perspectives on Global Health Issues, Vijay Agnew, ed., Toronto, Canada: Centre for Feminist Research, York University, 2003. “Communities of Interest, African American History and the Courts,” in Darling, ed., Race, Voting, Redistricting and the Constitution: Sources and Explorations on the Fifteenth Amendment, Volume 3: Alternate Redistricting, Registering and Voting Systems, Controversies in Constitutional Law Series, New York: Routledge Press, August, 2001. “Homecoming,” [Scholarly Narration Text for one hour PBS film on Black Land Loss in the American South], January, 2000. "Civil War to Civil Rights: The Quest for Freedom and Equality," in Mario J. Azevedo ed., Introduction to Africana Studies, Carolina Academic Press, 2nd. Edition, 1999. "Lifting As We Rise: Black Women in America," in Mario J. Azevedo ed., Introduction to Africana Studies, Carolina Academic Press, 2nd Edition, 1999. "The State, Friend or Foe? : Distributive Justice Issues and Challenges," in Jael Silliman, ed., Dangerous Intersections: Feminist Perspectives on Population, Environment & Development, South End Press, 1999. “What’s Oral History Got to Do with Understanding Voting Rights: Reflections on the Methodology of the Voting Rights Act Documentation Project,” in Ronald Walters, ed., HUArchivesNet, November, 1999, [http://www.huarchivesnet.howard.edu/9911huarnet/darling1.htm]. “Equity, Ethics and the Privatization of Life in BioAgriculture,” in Political Environments: A Publication of the Committee on Women, Population and the Environment (CWPE), Amherst, MA: Hampshire College, Fall, 1999. "Ties That Bind: A Review of BELOVED," in Barbara H. Solomon, ed., Critical Essays on Toni Morrison's "Beloved," Critical Essays on American Literature, G. K. Hall Publishers, 1998. "African American Women State Legislators in the South," in Sue Thomas & Clyde Wilcox, eds., Women and Elective Political Office: Past, Present, and Future, Oxford Univ. Press, 1998. "We Have Come This Far By Our Own Hands: African-American Self-Help and Corporate Philanthropy," in African Americans and the New Policy Consensus: Retreat of the Liberal State, Marilyn E. Lashley & Melanie Njeri Jackson (eds. ), Westport, CT: Greenwood Press, 1994. "Teaching About Race, Ethnic Identity and Community in the Good Society," in Richard R. Guzman, ed., Reflections on the Good Society, Chicago, IL: Association of Graduate Liberal Studies Programs, Fall, 1994. "In the Realm of Responsibility: A Conversation with Toni Morrison," in Danielle Taylor-Guthrie, ed., Conversations With Toni Morrison, Jackson: University Press of Mississippi, 1994. "Black Landownership," in Charles R. Wilson & William Ferris, eds., Encyclopedia of Southern Culture, Chapel Hill: University North Carolina Press, 1989. "In the Realm of Responsibility: A Conversation w/Toni Morrison," Women's Review of Books, V, 6, March, 1988. "The Wilson’s Hang On," 40 Acres and a Mule, Vol. II, No. 6, June, 1979, p.3ff., Jackson, MS: Emergency Land Fund. Marsha J. Tyson Darling (2008), “Advancing Reproductive Justice in Gender and Development: The Challenges Posed by New Reproductive and Genetic Biotechnologies. Oxfam, GB, Routledge/Taylor and Francis. Marsha J Tyson Darling (2011, August). "International Ova Trade and Surrogacy Arrangements: An Urgent Need for Legal Regulation on the International Level". 2nd Annual Tarrytown Meeting on Genetics and Society, Tarrytown Estate Conference Center, NY. Marsha J Tyson Darling (2010, November). "Are Black Folks Really Different After All: Genetics and Race Based Medicine in the Age of Obama." Examining Race in the 21st Century Second Biennial Interdisciplinary Conference on Race. Monmouth University, West Long Branch, NJ. Marsha J Tyson Darling (2010, August). "Reproductive and Genetic Tourism". The Tarrytown Meetings on Genetics and Society, Tarrytown Estate Conference Center, NY. Marsha J Tyson Darling (2008, November). "The Intersection of Race, Gender, Medicine and Science in Historical Perspective." Future of an Illusion, Future of the Past: An Interdisciplinary Conference on Race. Monmouth University, West Long Branch, NJ. Marsha J. Tyson Darling (2008, April). “The Impact of Emerging Biotechnologies on Women, People of Color, and LGBTQ People,”. University of Connecticut at Stamford,. Marsha J. Tyson Darling (2008, March). "Production and Reproduction in the Old South: the Lives and Work of Enslaved Black Women,”. Adelphi History Conference on Women’s History in Perspective, Adelphi University, Garden City, NY. Marsha J Tyson Darling (2007, December). "Investigating Immigration Controversies in the United States." 5th International Conference on History: From Ancient to Modern. Athens Institute for Education and Research, Athens, Greece. Marsha J.Tyson Darling (2007, November). “Women, Peace and Justice Panel,”. Adelphi University, Garden City, NY. Marsha J. Tyson Darling (2007, October). “Using Intersectionality to Appraise Challenges to Women’s Health in the Gene Age,”. New York State Society of American Medical Technologists, Continuing Education Seminar, New York Hospital of Queens, Flushing, NY,. Marsha J. Tyson Darling (2007, July). “Gender, Race and Justice in the Gene Age: The Challenges Presented by Reproductive and Genetic Biotechnologies,”. Socialism and Environmental Justice Summer School Program, Fordham University, NY,. Marsha J. Tyson Darling (2007, June). "Reflections on Gender and Justice in the Gene Age: The Challenges Presented by Reproductive and Genetic Biotechnologies,”. WONBIT Conference: Women on Biotechnology, Scientific & Feminist Approaches, University of Rome, Italy. Marsha J Tyson Darling (2007, June). "Gender and Justice in the Gene Age: The Challenges Presented by Reproductive and Genetic Biotechnologies," WONBIT Conference: Women in Biotechnology, Scientific & Feminist Approaches. University of Rome, Rome, Italy. Marsha J Tyson Darling (2007, January). "Gender and Bio-Politics: Ethical Issues in the Context of Assisted Reproductive and Genetic Technologies (ARGT)" National Consultation on New Reproductive Technologies and their Implications for Women. Jawaharlal Nehru University, New Delhi, India. Marsha J Tyson Darling (2006, November). "Research Based Policy: Reproductive Justice in the Gene Age,". APHA Women's Caucus, 134th American Public Health Association Conference, Boston, MA. Marsha J Tyson Darling (2006, March). "The Creation of a 'Shadow Economy': The Feminization of Wage Labor and Microenterprise in the U.S.". Oxford Round Table on Diversity in Society, Oxford University, United Kingdom. Marsha J Tyson Darling (2005, December). "Evidence Based Policy and Practice from a Feminist Perspective: Gender and Justice in the Gene Age," APHA Committee on Women's Rights. 133rd American Public Health Association Conference, Philadelphia, PA.
Marsha J Tyson Darling (2004, November). "Responsible Governance of the New Human Genetic Technologies: New Voices, New Perspectives". 7th World Congress on Bioethics, University of New South Wales, Sydney, Australia. Marsha J Tyson Darling (2004, July). "Social Justice in the Gene Age: the Case for Biodiversity,". Future Human: International Conference on New Directions in the Humanities, The Globalism Institute, Monash University, Prato, Italy. Marsha J Tyson Darling (2003, May). "Library and Classroom Faculty Collaboration in Teaching an African-American History Course," co-authored with Aditi Bandyopadhyay, Ph.D. The New Library: Challenges and Opportunities Conference, LaGuardia Community College/CUNY, Queens, NY. Marsha J Tyson Darling (2002, October). "Examining Globalization's Reach: Using Oral History to Examine Low-Income Women's Access to Microcredit and Microenterprise in Immigrant and Native U.S. Born Communities in New York City". Global Linkages: The Internationalization of Everyday Life Oral History Association Conference, San Diego, CA. Marsha J. Tyson Darling (1969, December). “Pedagogy for Advancing Minds,”. Professional Development Summer Institute, Adelphi University School of Education & Roosevelt Union Free School District Teacher/Leader Quality Program, Adelphi University, NY. "Marsha J. Tyson Darling, Narrator, “SEEK/COLLEGE DISCOVERY: 40th Anniversary at CUNY,”". CUNY - City University Television TV75. March 2008. "Marsha J. Tyson Darling, Ed., "Political Environments: A Publication of the Committee on Women, Population and the Environment (CWPE), Special Issue on Justice in the Gene Age". Garden City, NY: Adelphi University. August 2007.